Pastor Ron Taylor, a devoted community organizer, faith leader and one of IMAN’s dearest allies, passed away on January 20th, 2018. 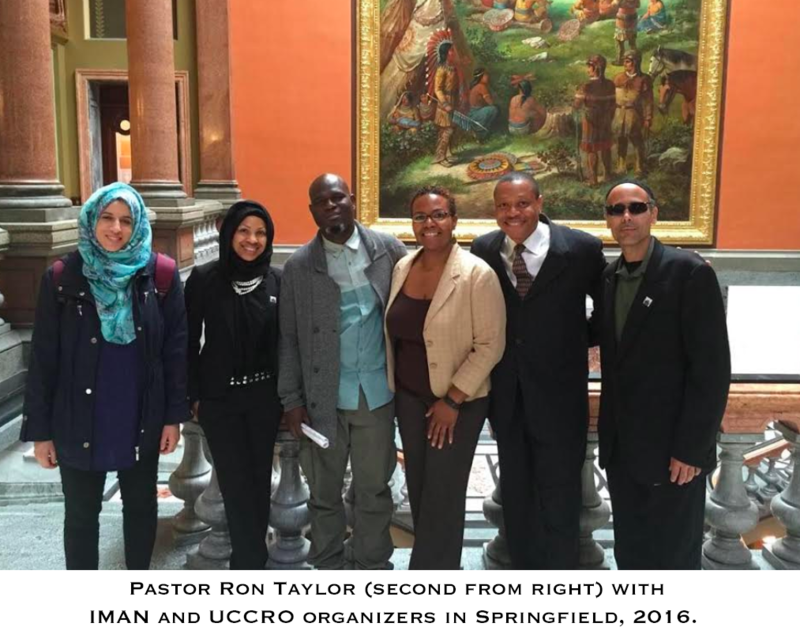 Lovingly known as “Pastor Ron”, Taylor was one of the founding members of United Congress of Community and Religious Organizations (UCCRO), where he served as Executive Director. He was also the founder and Senior Pastor of Disciples for Christ Church in Oak Lawn, Illinois. Pastor Ron worked diligently as a faithful servant and a compassionate community leader, always uplifting those around him. At UCCRO, he dedicated himself issues such as criminal justice and immigration reform advocacy, and worked relentlessly to connect communities across racial and religious lines. 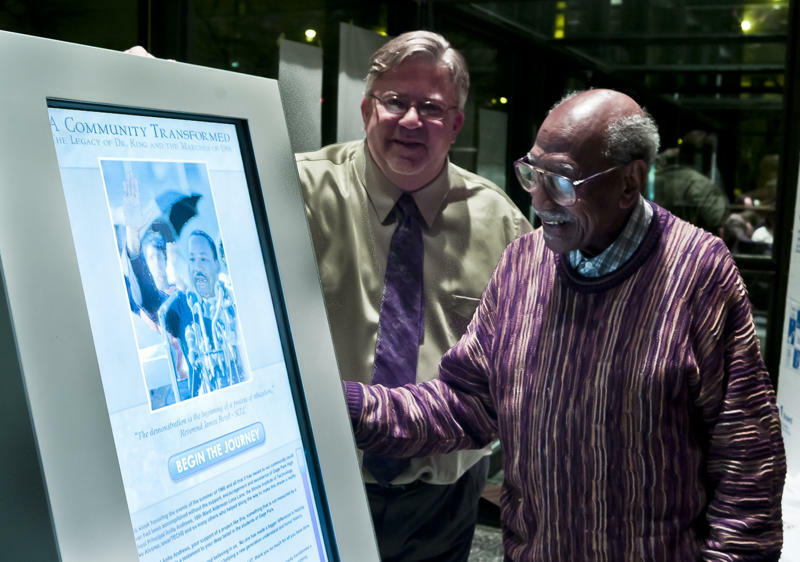 Pastor Ron was a passionate organizer and ingenious leader, but most of all he was a friend. I greet you all in the way of my tradition: Assalamu Alaikum, Peace Be Upon You All and good morning. On August 5, 1966, a rabbi by the name of Robert J. Marx wrote a letter to his fellow Chicagoland rabbis, admitting to them that he was scared. 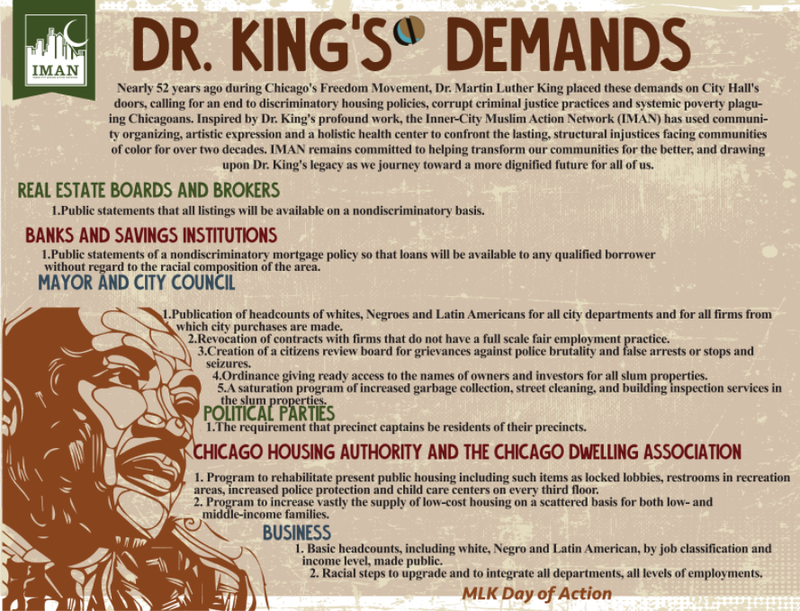 That afternoon, he would be joining Dr. Martin Luther King, Jr. and the Chicago Freedom Movement for a demonstration against housing segregation in Marquette Park, on the city’s Southwest Side. The letter wasn’t asking for permission from his colleagues, rather it was stating that despite his fear, and despite the fierce opposition that he knew his actions would illicit from many of his colleagues, his Jewish faith compelled him to be with the marchers that day. And of course, that day Rabbi Marx would join Dr. King and 700 other marchers into the park, and they would be met in turn by 5,000 angry protestors—men, women, and children, yelling, holding nasty signs, and throwing bricks and bottles at the demonstrators. Dr. King would go on to say that though he had faced the racism of the south, he had never seen mobs as hostile and as hate-filled as he had that day in Chicago. Rabbi Marx had founded the Jewish Council on Urban Affairs two years earlier and continues to this day to do incredible work that advances justice for marginalized people. As many times as I’ve read this letter, I’m struck every time by the profundity of Rabbi Marx’s statements: that at the core of his argument to his co-religionists is a plea to make their faith relevant to the issues people were facing at the time. And I guess I’m struck by that because in some ways, it’s the same struggle all religious communities have gone through and continue to go through throughout time, the struggle to make faith more than just ritual and dogma and rhetorical posturing. More than going to church on Sunday, or temple on Saturday, or to the Mosque on Friday. I was raised as a proud Southsider with two parents who had converted to Islam in the 70s, and I attended a full-time Islamic school in the southwest suburbs for 15 years before heading to college. And in those 15 years and in all the years since, I’ve witnessed that same struggle—my co-religionists, young and old, trying to grapple with how to marry all of the lofty ideals and higher purpose of our faith with the hard reality of our devastatingly flawed society and our own very human selves. Now, every year around Martin Luther King Day, I have to admit, I get a little agitated, and I know I’m not alone. I’m glad to see people and institutions commemorating King. I’m glad that his legacy is honored nationally; I’m glad that speeches and articles and news segments are done about him. But I wish that I saw as many people and institutions making plans to address the issues Dr. King made it his life’s mission to address. I wish I saw as many legislative advocacy days planned for that day—“Write Your Legislator” events or the like. As many Day of Service invitations as I receive, I wish I received as many Day of Action notices. Because as many speeches as King gave and as much service as I’m sure he encouraged, he wasn’t after handouts. He was after justice and as he reminded people over and over again, justice doesn’t come with time, justice comes when you demand it. The first is that we could ill afford fifty years ago, and we cannot afford now, for good people to remain silent on issues of injustice. I think we know what’s at stake now given all of the interesting times we’ve had over the last 14 months. I believe that we’ve moved beyond a time where we can simply hate an injustice in our hearts or make excuses for oppressors. We can no longer just shake our heads at the television screen when we hear that 200,000 Salvadorans that are in this country legally will be deported, or that children across the country will no longer have access to health insurance, or that all of a low-income neighborhood’s public high schools will be shut down, or that yet another unarmed black man or woman was shot and killed by someone that was supposed to protect them. We can’t afford to be the silent majority. The second lesson I draw from King is that justice can’t wait. There will never be a convenient time to allow people their human rights, not when that allowance would disrupt the status quo and stop the flow of dollars into the hands of people who benefit from it. King talked about the ‘fierce urgency of Now’ and now 50 years later, I think in some ways the urgency today is even fiercer, as we see civil protections and social advancements that were made after King’s time rolled back in order to Make America Bleak Again for so many millions of people who had begun to hope that maybe there was a way they could get by. I think there were many of us here who witnessed a dark year in 2017. But even in the darkness, there was light, which brings me to the last lesson I’m focusing on this year. That lesson is one about the balance between hope and despair. Remember that in Rabbi Marx’s letter, he told his fellow rabbis that he was afraid. He had been a conscientious observer at one of King’s earlier marches and he had seen grandmothers and grandchildren ready to kill the marchers out of rage. He was afraid, and yet he joined them. In an interview that Dr. King gave the year before he was assassinated, he admitted that the dream he had preached so passionately about four years earlier had turned into a nightmare. He realized that, as he says, “some of the old optimism was a little superficial.” But through the soul-searching and the agonizing he said he did over the actions he and his organization were pursuing, he still had hope. Now, please indulge me as I go on a slight tangent. When I was preparing for this talk, I looked at the Beverly Unitarian Church website and I came across a beautiful note from your minister and in it I read that this congregation is made up of a wonderful collection of people, some who believe in God all of the time, some who believe in God some of the time, and some, none of the time. Well, I’m one of those who believes in God all of the time but I want to share a confession with you. I had the opportunity to attend a powerful retreat a few months ago and there was this remarkable woman there who was a master of several Islamic sciences, had memorized the entire Qur’an in Arabic, and was a celebrated medical doctor to boot (talk about life goals). Her name was Dr. Nadia Katranji and she was doing a workshop on digging into the actual language of the Qur’an in the original Arabic in order to make the text have deeper meaning to our lives. In Islam, we talk about “belief” a lot. It’s riddled throughout all of our texts, throughout the Qur’an and throughout the vast collection of prophetic traditions we have. “Oh you who believe…do good so you may prosper.” “Oh you who believe, be conscious of God.” “None of you truly believes until you want for your brother what you want for yourself.” We really like the idea of belief. But at this retreat, Dr. Nadia, gave us something really groundbreaking to think about. She said that though the word in Arabic—aamana—was commonly translated as “to believe”, at its root, the word really means “to trust”. When she said that, it was like a whole world opened up to me; I experienced this expansion that I can only describe as feeling like a mountain was lifted off of my shoulders. Because belief is a tall order. To believe in someone or something that you can’t see, to believe in the notion that someday, somehow justice will prevail, to believe that people will ultimately rise above their greedy, complacent egos and consent to agreeing to change that may make them uncomfortable. Belief is scary. But trust, to me, is somehow so much more achievable. I can’t prove to myself or to anyone that a loving and just Creator exists. I can only trust that He does and that’s He’s got a better plan than mine. I can’t say for certain that if my great-grandchildren still look the way I do and pray the way I pray that the world is going to be any kinder to them than it is to me. I can’t say without a shadow of a doubt that in 50 years time, we won’t still be marching for and preaching about the same human rights that King journeyed for all those years ago. But I can trust in my fellow human beings, in people of faith, in people of consciousness, I can trust that together those people will not stand idly by and allow oppression to take place on their watch. In Arabic, one of the names for Satan is Iblis, and that name Iblis comes from the root word “balasa”, which means to despair. So if we’re to understand that the core of Satan’s mission is to get human beings to despair of the mercy of their Lord and the mercy of their fellow human beings, then what of hope? We reflected on the march that Dr. King and Rabbi Marx and the Chicago Freedom movement made into Marquette Park on August 5, 1966. We talked about the 5,000 protestors that gathered to stop them. What we didn’t talk about was that the fact that on August 5, 2016, about a year and a half ago, IMAN, the organization I work for, and hundreds of people from dozens of other local organizations and institutions, cut the ribbon on the city’s very first permanent memorial commemorating Dr. King and the Chicago Freedom movement in Marquette Park. What we didn’t talk about was the fact that the very next day, 1400 people from all walks of life, from all ethnicities, from all over the city and the country gathered to retrace the march that Dr. King led into the park all those years ago, and this time, did so triumphantly, proclaiming our commitment to transforming our communities for the better, proclaiming our commitment to holding one another up as family, and recognizing the power that a little hope can have. As I wrap up, I’ll say this. I work for an organization, IMAN, that has been attempting to foster health, wellness, and healing in the inner-city for 20 years. We do that through community organizing, we do that through an affordable health clinic, through providing housing and job training to young people and to men coming home from prison, to drafting and passing legislation around criminal justice reform, and through cultivating art and creative expression. 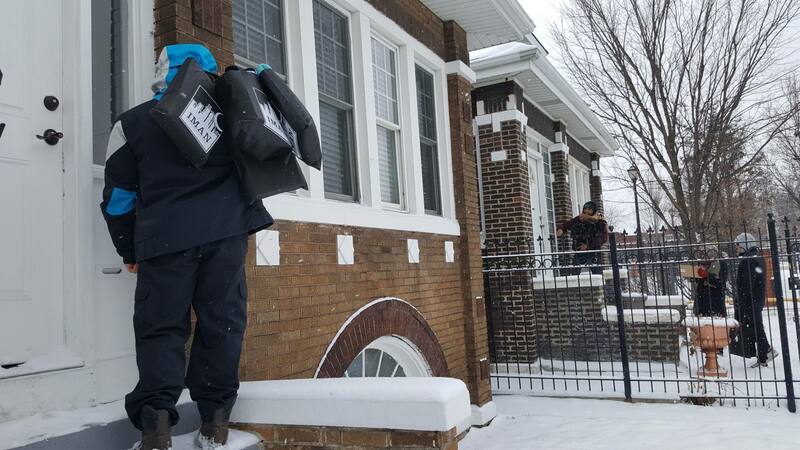 Tomorrow, our community organizers and leaders will be continuing our door-knocking campaign, deepening our relationships with 200 of our closest neighbors, handing out bus cards and warm blankets, and reminding them that we are there when they’re ready to get out on the streets and organize with us. Last year at this time, we urged our community to make three commitments on MLK Day and I’ll encourage everyone here to do the same. 1.) On the community level: In the next month, commit to doing 3 relational meetings with someone from a completely different walk of life than you. Maybe they’re sitting in this congregation with you, maybe they’re a neighbor or someone you see on your daily train ride. Have a conversation with someone about what moves them, about how they see the world. 2.) On the family level: Schedule one family dinner, inviting others from another community to your kitchen table so that your home can become a site of genuine engagement with our diverse lived experiences. 3.) On the individual level: Commit to at least one individual act of solidarity, standing with or for those outside of your immediate community: organizing a prayer at a detention center, attending a public hearing on solitary confinement, participating in a rally, or any other action that amplifies our voices and uplifts the dignity of people in other communities. Choose something and make your presence known. You get bonus points if you can do one of those things tomorrow, on actual MLK Day. Also, if you’ve got some time tomorrow or in the week, I would encourage you to visit the MLK Living Memorial at 67th and Kedzie. It’ll be a cold one tomorrow but it’s a beautiful place for contemplation about the commitments you’re making today and…Dr. King went through worse. Rabbi Marx clearly found a role for his faith to play in this world and I believe—I trust—that all of our faiths, philosophies, and our inclinations toward goodness, have a role to play too. Thank you so much and Assalamu Alaikum/peace be upon you all.